I'm amazed. It's mid December and Fall color is still to be found around the Phoenix area. Fall seems to last forever here in Arizona. 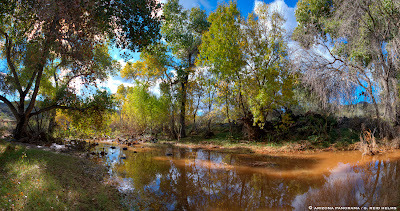 These shots taken at the Spur Cross Ranch Preserve just outside Cave Creek still have plenty of Fall color. And there's still plenty to come. Most of the cottonwood trees were green on one side, yellow on the other. 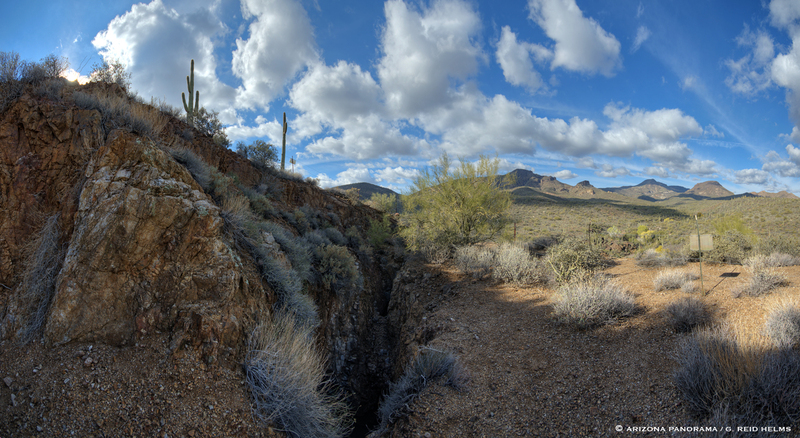 A recent winter storm turned Cave Creek into a rich, chocolate-color. This area known as The Jewel of the Creek is a lush ribbon of life with giant cottonwood and sycamore trees. And there's plenty of wildlife here too. Deer, coyotes, javelina, cottontail and Jack rabbits etc. I saw fresh deer sign and tracks while hiking around. Quail and other desert birds were in no shortage either. The Preserve is one of Maricopa County's newest parks. Hiking abounds with every type trail for every type hiker or horseback rider. Serious hikers might enjoy the Cave Creek #4 trail which leads all the way back to Seven Springs over 11 miles away. You can leisurely hike around the creek in the heart of the park or charge up the mountain sides all the while enjoying this pristine example of the Sonoran Desert. I saw all the major players in the plant community: Jojoba, cholla, saguaro, yucca, ocotillo, cottonwood, sycamore, palo verde.